Paul is shipwrecked, and all on board swim to shore, and none are drowned. SHIP WAS leaving port of Caesarea, and among the passengers on board was Paul, the prisoner. As the shore faded away in the distance, Paul saw his last glimpse of the land that is dear to the heart of every Jew, for never again would he return to this country. Paul was not the only prisoner on board that vessel. Before leaving Caesarea he and several others had been given into the keeping of a Roman centurion whose name was Julius. Festus had commanded this centurion and his soldiers to bring the prisoners safely to Rome and deliver them to Caesar. No doubt the Christians who lived in Caesarea gathered at the seashore to watch their beloved friend sail away toward far-off Rome. And no doubt they wept when they realized that Paul would not return to them again. But Paul was not the only Christian among the passengers. Two of his friends, Luke, the doctor, and Aristarchus, who had been with him. So they all boarded the vessel and sailed away to Italy. The next day after leaving port at Caesarea the ship stopped at Sidon, a seacoast town of Phoenicia, which is north of the homeland of the Jews. In this city Paul had some friends, and by this time he had won the respect of the Roman officer, who kindly allowed him to go ashore with Luke and Aristarchus and a soldier. There they visited for a short time with the Christians who lived in Sidon, and then returned to the ship. Their next stopping-place was at Myra, a city on the southern coast of Asia Minor. Here the centurion found another ship ready to sail for Italy, and because their first vessel would not take them all the way he and his soldiers transferred their prisoners to this ship. From Myra the ship left the shore and pushed out once again into the great Mediterranean Sea. But it made little progress, for the winds blew against it. Finally, after sailing many days, the passengers were gladdened to see the Island of Crete. Here they stopped in a harbor called the Fair Havens. After resting for some the captain of the vessel thought about putting out to sea once more. But Paul protested, saying, "This voyage will bring much trouble upon us, for sailing at this time of the year is very dangerous." He urged them to remain in that port for the winter. But the centurion believed they could reach another port not far away. And because the port at the Fair Havens was not a desirable place, the captain and many of the passengers were eager to go farther before they should stop for the winter. On the first fair day the ship glided out of the harbor and entered the broad sea. But they had not gone far when suddenly a tempestuous wind swept down upon them. They could not turn back, neither could they sail on to the port for which they were bound. All they could do was to toss about on the angry waves, not knowing how soon the ship might be torn to pieces. Now, when all too late, the captain and the centurion saw that Paul had spoken wisely when he urged them to remain in the harbor at the Fair Havens. At once they set about trying to save the ship. They threw out everything that might be spared to lighten the weight of the vessel, and waited anxiously for the storm to pass. But the storm raged on. Day after day passed by and still the sky frowned down upon them with dark clouds and cold rains, and night after night came and went without one bit of light from the moon or stars. One morning Paul, the prisoner, stood up on the deck and shouted to the sailors and passengers, trying to make his voice heard above the roar of the storm. They listened, and heard him say, "Sirs, if you had believed me when I warned you at Crete you would not have suffered the harm of this storm. But now be of good cheer, for there shall be no loss of life among us, only of the ship. This I know because an angel of God, to whom I belong, and whom I serve, stood by me last night and said, 'Fear not, Paul; you must be brought before Caesar. And lo, the lives of all these who sail with you God has given to you.' Therefore I urge you to be of good cheer, for we shall all be saved alive, although we shall be cast upon an island and the ship lost." While the sailors had been struggling against the storm, Paul had been praying, and God had sent an angel to cheer him with this message. For Paul longed to see Rome, even though he must be taken there with chains on his hands. 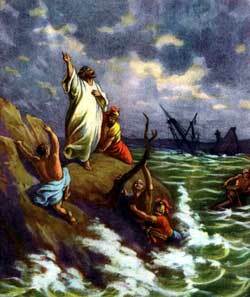 But the storm did not cease when Paul spoke to the men, and still they feared they might all be drowned in the sea. When two weeks had passed by, one night the sailors found they were nearing some land. They had no way of telling where they were, for they had drifted on the waves for many days, and they could not see the moon and stars. They could not tell whether they were nearing a rocky coast or a sandy beach, and not wishing to drift any nearer they threw the anchors overboard and waited anxiously for the morning light. The sailors knew the dangerous condition of the ship. They saw how helpless it was before the storm. They doubted whether they could bring it to shore. So now they planned to escape, leaving the passengers and prisoners on board the sinking vessel. They prepared to lower a boat, as if to cast more anchors into the sea. But Paul knew what they were planning to do, and he said to the centurion, "Unless these sailors stay in the ship, we can not be saved." Now the Roman officer believed Paul's words, so he hastily cut the ropes that held the boat, allowing it to drift away into the darkness. When the daylight was coming on Paul urged those on board to take food. For many days they had not eaten a proper meal, being too worried to feel their hunger. Now they were weak, and Paul knew their bodies needed food to strengthen them. He reminded them of the angel's words, that not one hair of their heads should perish; and when he had spoken thus he took bread and gave thanks to God before them all. Then he ate of it, and the others took courage and also ate. After all had eaten, they threw overboard the wheat their ship was carrying to Italy. And everything else that added weight to the ship and might be spared they threw into the sea. Now the daylight shone clearly enough for them to see the land near by. The sailors did not recognize it; but they saw a place where there was a sandy shore, and lifting the anchors, they tried to steer the ship into this place. As they went the swirling waters caught the ship in a narrow place, where it struck a hidden rock and stuck tight. Then the rear of the ship was broken by the violent sea. The soldiers on board knew they must give their own lives if their prisoners should escape, and not wishing to do that, they urged the centurion to allow them to kill all the prisoners at once. But because the centurion loved Paul, he refused to let them do this. He commanded every one who could swim to jump overboard and swim to land, and those who could not swim he commanded to take broken pieces of the ship and float upon them toward the shore. No time was lost, and every one, wishing to save his life, struggled through the water toward the sandy beach. And not one of all the two hundred and seventy-six on board the sinking vessel was drowned.